The Richmond 3 Drawer Bedside Table is a convenient storage solution for all of your bedside needs. Crafted from beautiful solid oak and complete with country style finishing touches, the stunning The Richmond 3 Drawer Bedside Table is perfect for any stylish home looking to de-clutter and get organised. Designed with contemporary trends in mind and built from superior oak material, the Richmond 3 Drawer Bedside Table is a timeless beauty. Solid white oak combined with oak veneers provides seamlessly stunning structure for your bedroom belongings. 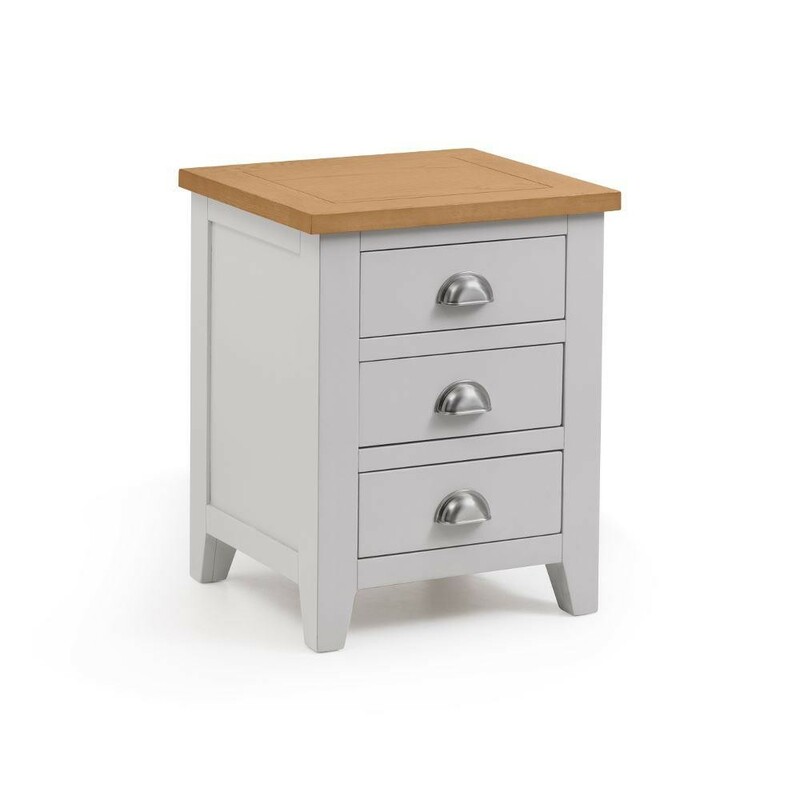 The beautifully crafted Richmond 3 Drawer Bedside Table is coated in a warm elephant grey lacquer for an ageless, durable style. The Richmond 3 Drawer Bedside Table features oak veneers for a seamless build with a classical edge. Contemporary touches such as the polished metal handles give the Richmond 3 Drawer Bedside Table a timelessly gorgeous appeal. The Richmond 3 Drawer Bedside Table features three equally sized, individually crafted solid oak drawers perfect for storing items close to your bed. The convenient surface is suitable for displaying vital belongings like phones and alarm clocks. The drawers are a sturdy construct built to endure the test of time, finished with pretty polished metal handles for modern flair. The Richmond 3 Drawer Bedside Table arrives fully assembled with no DIY needed. Shop the full Richmond collection to complete the theme of contemporary country living.